A 27-year-old woman and an eight-year-old boy she was a carer for have died after being hit by a truck on the Pacific Motorway near Newcastle in New South Wales. Police said the woman's car had stopped in a breakdown bay on the M1 at Cameron Park, near George Booth Drive, on Sunday evening. "The driver got out of the vehicle and opened the side door," Acting Assistant Commissioner Stuart Smith said. "At that stage we believe an eight-year-old child has entered the roadway, followed by a 27-year-old carer. "Obviously both were killed, we believe instantly, when a Pantech-looking truck travelling south collided with both of those." The woman, from Cooranbong in southern Lake Macquarie, and the child, from Woy Woy, were not related, police said. Newcastle duty officer Jeff Little said the accident scene was a confronting one for police. "A long night for police and certainly nothing prepares you for those situations," he said. Acting Assistant Commissioner Smith said the deaths had left many families mourning. He said it was a horrific situation for everyone involved and emergency services personnel had been offered counselling. "I know how I felt when the phone call came and I was deploying crash investigators last night," he said. "We were already reflecting feedback from the roadside that it was a terrible tragedy. "There's grief counselling for emergency services at the moment, and then we've got to deal with the wider grief of family members, which is going to be forever." The 57-year-old truck driver was treated for shock and taken to hospital for mandatory drug and alcohol testing. A pregnant carer ran into the path of a truck in a bid to save the life of an eight-year-old autistic boy who had jumped out of their car and raced across the M1 Motorway. The Cooranbong woman, 27, and the boy were killed instantly when the truck hit them in the southbound lanes on one of the nation's busiest roads about 5.30pm on Sunday. It is unclear why the woman stopped in a breakdown lane of the M1 Motorway at Cameron Park, although it is believed the boy had a history of attempting to flee moving vehicles. "What we do know yesterday was that a Tarago van was travelling south on the M1 at Cameron Park. They pulled into a breakdown bay," Traffic and Highway Patrol acting Assistant Commissioner Stuart Smith said on Monday. "The driver got out of the vehicle and opened the side door. "At that stage, we believe an eight-year-old child has entered the roadway followed by a 27-year-old carer. "Obviously both were killed, we believe instantly, when a pantech truck travelling south collided with both of those individuals." Police were still contacting relatives of the dead woman on Monday afternoon. The boy is believed to be a ward of the state and cannot be identified. A Family and Community Services spokeswoman released a short statement, which read: "The death of any child is a tragedy. The Department of Family and Community Services (FACS) was deeply saddened to hear about the death of a young boy and (the) woman near Newcastle on Sunday. "As this is currently a police investigation, FACS is unable to comment further." The truck driver, a 57-year-old man, was severely shaken by the incident and was taken to John Hunter Hospital suffering shock. He would also undertake mandatory blood and urine testing. The welfare of emergency services personnel who attended the scene is also being closely monitored because of the tragic circumstances. There were nine deaths across NSW roads on the weekend, including a second double fatality near Deniliquin on Saturday night where two men were killed when a utility rolled. 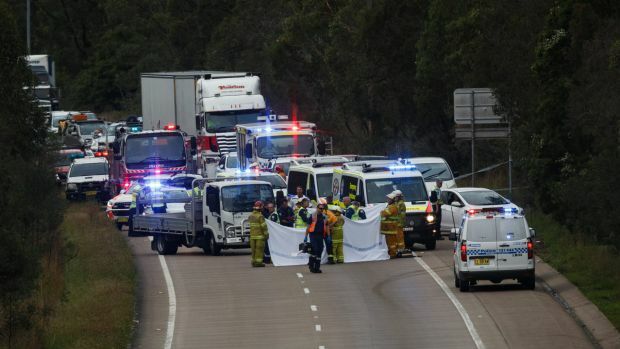 "The weekend has been an absolute tragedy on NSW roads," Mr Smith said. "A tragedy is probably an understatement. We had nine deaths." He later added: "It is a tragic day for emergency services, but the nine deaths on the weekend would be affecting hundreds more." "There would be families who are grieving today. All of the investigations are underway and it's critical we get to the bottom of them." A 27-year-old carer and an eight year old boy were both killed, after the boy fled his car and ran into oncoming traffic on the M1 motorway. A PREGNANT 27-year-old carer and an eight-year-old autistic boy in state care were both killed instantly, after they were both struck by an oncoming truck on the M1 motorway near Newcastle. Police believe the woman, named by News Corp as Rachel Martin, had pulled over to the breakdown lane, when the boy dashed on to the M1 Motorway. The carer chased after the boy into the path of the oncoming truck, at around 5.30pm on Sunday. It is believed that the boy had a previous history of attempting to flee moving vehicles. The Traffic and Highway patrol acting Assistant Commissioner Stuart Smith told the Sydney Morning Herald that the car was travelling south on the M1 at Cameron Park and then they pulled into a breakdown bay where the driver got out of the vehicle and opened the side door. “We believe an eight-year-old child has entered the roadway followed by a 27-year-old carer. A Department of Family and Community Services (FACS) spokeswoman told the AAP on Monday that the death of any child is a tragedy and they were deeply saddened. The truck driver, a 57-year-old man, suffered shock from the incident and was taken to John Hunter Hospital, where he undertook mandatory blood and urine testing. A total of nine deaths occurred across NSW roads on the weekend with Mr Smith telling the Sydney Morning Herald that it had been an absolute tragedy. “It is a tragic day for emergency services, but the nine deaths on the weekend would be affecting hundreds more”.